Spanish National pattern / Money Bag type / made in Italy, 18th century. 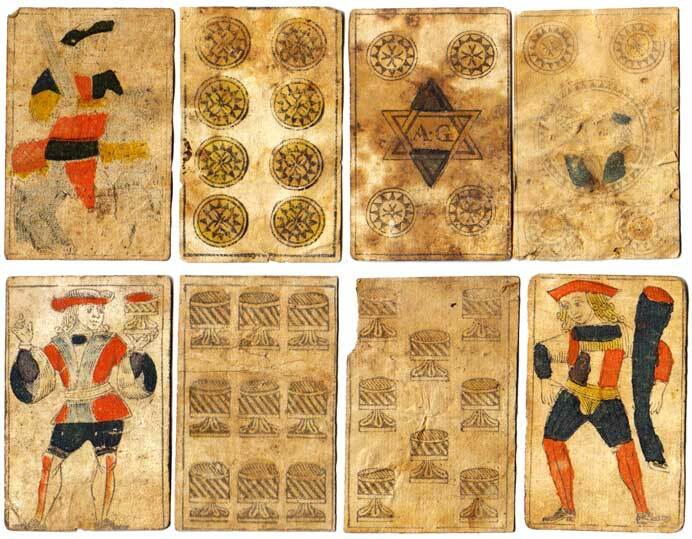 As well as cards made in Italy for Italians to play with, Spanish-suited cards were made for export or for visitors. Genoa was an exporter of Spanish cards, and makers such as Bosio, Bergallo, Armanino and Solesio all exported packs of Spanish-suited cards, including some made for South American countries. In the standard version of the Spanish National Pattern, the Jack (Sota) of Coins usually holds in his right hand a kind of horn, but in many examples made in Italy this becomes a small bag, hence the name of this sub-type: Money Bag type. See also: Money Bag type by Pedro Bosio. 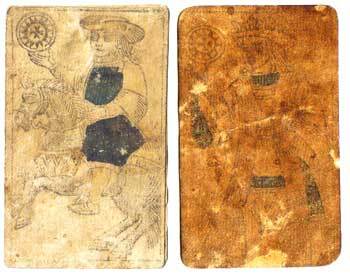 Above: woodblock-printed and stencil-coloured Spanish-suited playing cards made in Italy by Agostino Bergallo for export to Spanish territories, 18th century. The Ace of Coins carries the maker's name and the Spanish coat-of-arms, and there is a scarcely-legible inscription on the Two of Cups. 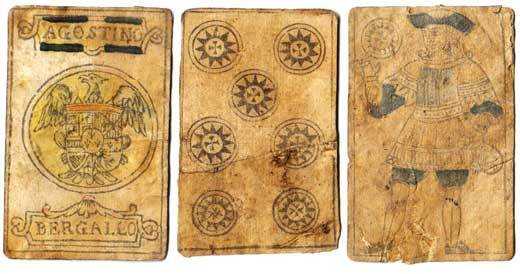 Above: some additional cards of a similar style and date were found with the above deck, with the initials A.G. inside a six-pointed star on the Four of Coins. The Five of Coins has the traditional facing profiles of Ferdinand and Isabella. Close examination of the Coins and Cups symbols shows slight differences in design between some cards and the cards from the deck shown above by Bergallo. However, in other respects the cards are difficult to sort out into their respective packs. 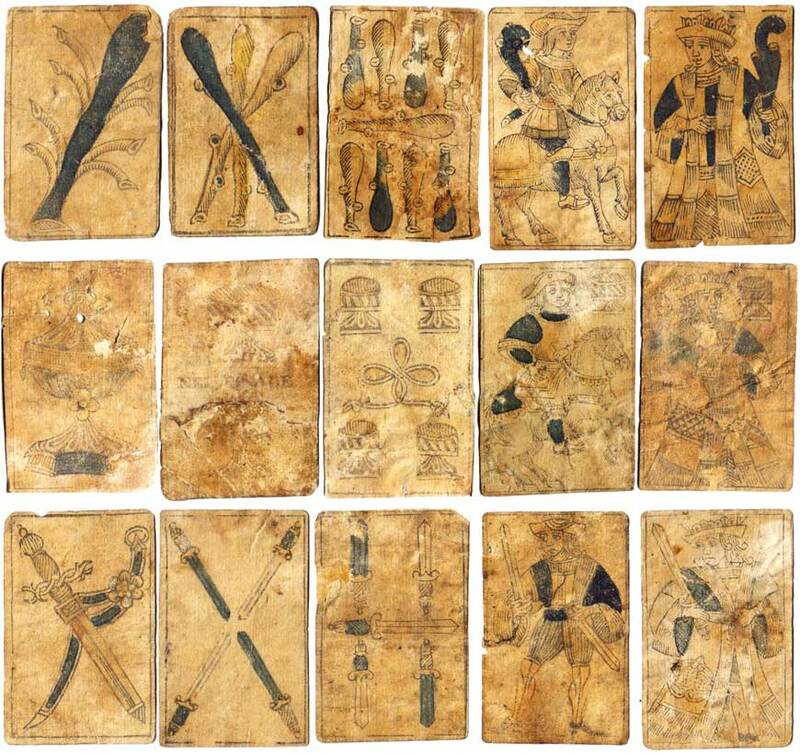 The cards have come to light in a collection in Chile.